Is the month where Chinese family is busy busy with preparing the Lunar New Year that fall on next month ( Feb ) . I have so many plan in my heads for this year , as my girl grow older , I wanted to introduce to her ALL Chinese Festival . However , days and weeks seem flying faster than it used to be for me nowadays. Before I knew it , I only left 2 weekends to prepare and one weekend was down as I need to visit the folks in Sunshine Coast. My panic mode seem to switch on and the result of this , will be either no baking at all or bake in full force. To collect myself and get it started , I need to be more efficient and plan out well . ( Ya talking about planning again !!! ) My beloved told me to be easy , he always support what I want to do but to do it out of stress or enjoyment is a thin line. After hearing his advise, yup I should back to where I am , bake with happy spirit and not stress. After all , I do not have a whole village to give or feed. So just relax and enjoy . 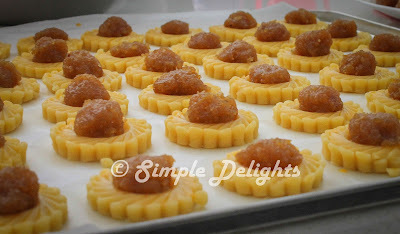 To start of my baking , always do something that will motivate me - Pineapple Tarts. 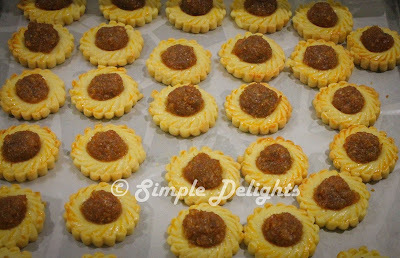 It just seem missing if we do not have Pineapple Tart during CNY. 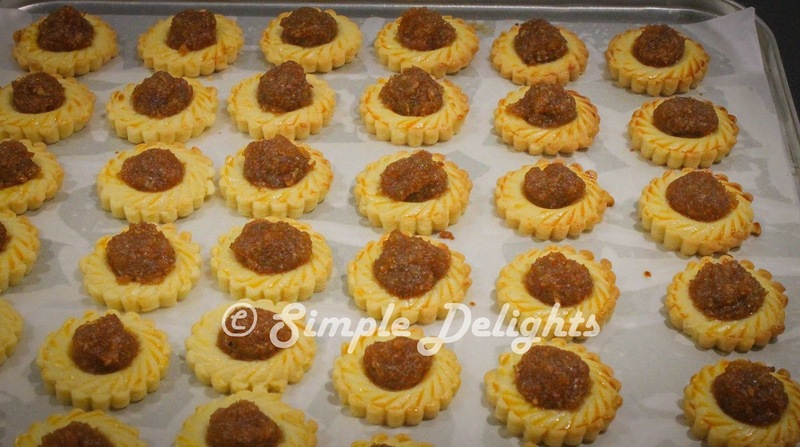 I have done the close version before ->pineapple-tarts 2014. I did an open version last year but it was fail . I did in a rush and my baby was not corporative then . The dough stick in the mould and having a crying baby. I gave up !! 1. Mixed butter and sugar with hand held electric mixer till combine and creamy. Add in egg yolks mix well and add in 2 Tbsp milk incorporate well into the mixture. 2. Pour in the flour and mix with spatula and do not knead. The texture of the dough is soft but is not hard to combine the flour well into the butter. 3. Wrap the dough in cling wrap and chill in the fridge at least 30min. 4. Roll out the dough to 5mm thick. Press with prefer mould cookie cutter and arrange the cookies on the baking tray line with baking sheet. 5. The cookies will not spread so is ok to place it next to one another. 6. 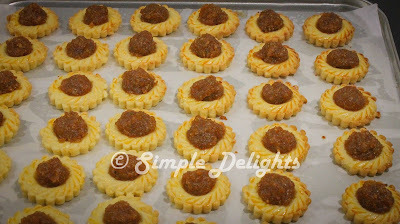 Brush with egg wash and place the round pineapple jam in the middle of the tarts. 7. Preheat Oven to 165C ( this is for my oven. So do adjust according to your oven standard) . Bake for 15min. This time was a success for me. I reckon chilling the dough in the fridge help to get the tarts out from the mould easily . I have to on the air conditioner while cutting the dough. Australia summer is no joke and can be more heat up compare to Malaysia. What an expensive cost to bake this tarts. The Tarts come out well from the mould and brushing some egg wash make the tarts has some color and I think it help the jam sit well on the tarts. Am happy with the result and this is faster compare to the close version. Would prefer to make the closed version but time is really something a new mom does not quite have. 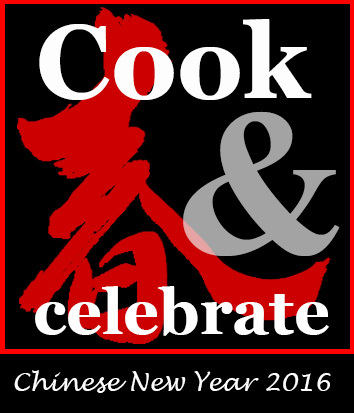 This post is linked at Cook and Celebrate: Chinese New Year 2016 hosted by Yen from GoodyFoodies, Diana from The Domestic Goddess Wannabe and Zoe from Bake for Happy Kids at Here. You made it! These pineapple tarts look awesome! I'm sure that your family will love these homemade treats!